Lose weight now the William Howard Taft way! Dig this, you women of a certain age wondering how you will “have it all:” She married a Yale professor, and he moved to Swathmore College to follow her to her job! Granted, we’re not daughters of presidents or of Supreme Court justices most of us, but why does this concept still seem so revolutionary, nearly ninety years later? I wonder. Some of you heterosexualists have some explaining to do. 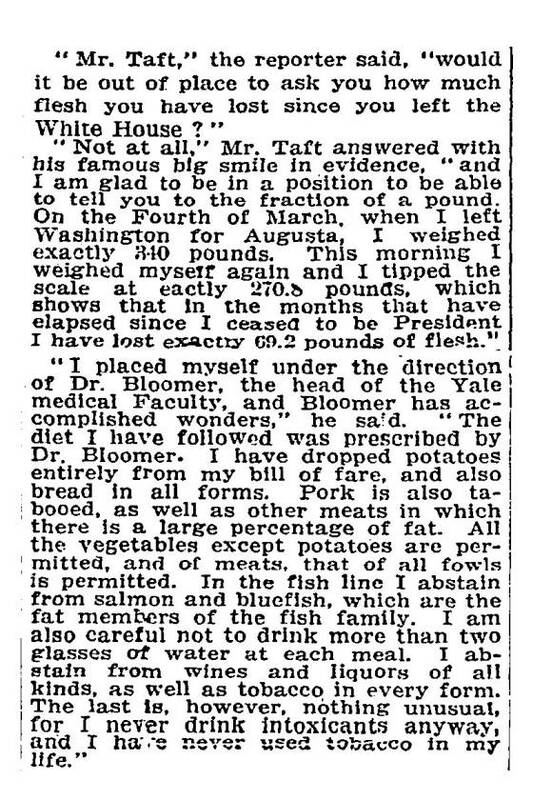 As for the Taft diet: it seems like pretty good advice to me, except for the part about avoiding the “fat members of the fish family.” If you watch your carbs and double-up on the veggies, salmon or bluefish are perfectly fine. Fratguy is avoiding wheat these days, but it’s not been too much of an adjustment as I had already cut out most of the pasta, bread, and potatoes from our diets. That, plus watching the drinkies, seems to be a pretty painless strategy for middle-aged health and beauty. Check out a pdf. by Mabel Lang, “Faculty Shows”–Bryn Mawr College, for an evocation about how emeritus life used to be different, and for more about Manning. If you think cutting pasta, bread, and potatoes is painless… you must have an EXTREMELY high tolerance for pain! Indyanna: I believe that when I was a student, HTM was still quoted for telling students to “pull [their] socks up” (i.e. stop snivelling and get it together). I believe that she was the storied Dean, in any case. I’ll have to look up that article by ML, who was still professing when I was there in the late 80s and early 90s. Nicoleandmaggie: I am a huge pain baby. These things just stopped tasting good to me a few years ago. Too many empty calories, I guess. But the longer you don’t eat them, the easier it is to continue not eating them, if that makes any sense. Italian eat a lot of pasta yet tend to be way slimmer than Americans. Maintenance is easier than losing weight. Starting from an acceptable weight permits you to have any food as long as you don’t overeat. Vigorous physical activity is the ultimate enemy of food calories. As an avid hiker, gaining weight is almost difficult for me. I do recommend high energy consuming activity as a food subsidy. Have you read Taft 2012? It’s fantastic. You should check it out. I had already cut out most of the pasta, bread, and potatoes from our diets. That, plus watching the drinkies, seems to be a pretty painless strategy for middle-aged health and beauty. Sounds like a fate worse than death to me. I prefer to keep the starch and the drink, and bike/ski/hike like mad. The results have varied season-to-season, but I currently weigh 50+ pounds less than I did a decade ago, so I guess it’s working for me. The trick is to find activities I enjoy, as opposed to serving time on the stairmaster. And finding those activities has been much easier in Utah than anywhere else I’ve lived. Tanya–I’m going to get that book. Thanks for the tip! That generation of women scholars were pretty amazing. He lost me on no wine or booze. On the history professor, all the women in my family of that generation were like that. It was later that everyone got so neo-Victorian-of-a-certain-class. The maiden scholar or maiden career woman concept, that’s post WWII from what I can figure out. Oder nicht? President Taft was on a low-fat diet after 1913 because his heart was clogged with dietary fat, and had multiple heart attacks during the 1920s. His doctor was Dean of Yale Medical School, George Blumer, who put him on a low-fat diet. Bluefish salmon tastes good because of the fat content, but is not a good idea for a guy already in bad shape. Taft lost 76 pounds on his pre-presidential diet in 1905-1906, gained it back as President while touring the country ion a train with a private dining car, and lost 96 pounds from 1913-1930 and kept it off using the low-carbohydrate diet summarized in the newspaper story above. Taft’s diet is explained at length using his doctor’s original diet plan instructions in “The Taft Diet: How President Taft Lost 76 Pounds,” his doctor also treated King Edward VII. The doctor even allowed Taft to drink a small amount of Hock wine each day. Jeezus motherfucke!!! There is William Howard Taft Diet comment spamme!!!!!!!! This is the greatest fucken thinge to ever happen on the goddamn motherfucken Internet!!! Reading along . . . cut out potatoes, yes . . . less bread, yes . . . limited water to two glasses a meal–what? Still, this did make me cut down on eating bread. Extremely helpful info specially the ultimate phase 🙂 I maintain such info much.